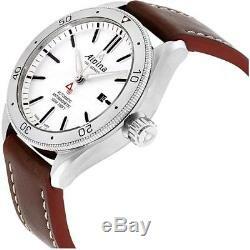 Alpina Alpiner Homme 44mm Bracelet Cuir Marron Boitier Acier Inoxydable Automatique Montre AL-525SS5AQ6. Délai de rétractation favorable (30 jours). Disponible Livraison Sous Jours Ouvrés. 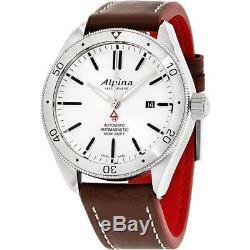 Alpina Alpiner Silver Dial Leather Strap Men's Watch AL525SS5AQ6. 44 mm silver tone stainless steel case with a silver dial, a scratch resistant sapphire crystal, silver tone luminescent hands and index hour markers. Minute markers around the rim. Date window adjacent to the 3 o'clock position. Logo beneath the 12 o'clock position. Hands: hours, minutes, and seconds. Case thickness of 14 mm. 22 mm-20 mm brown leather strap with a buckle clasp. Automatic movement and water resistant up to 100 meters. THE ORIGINAL SWISS SPORT WATCH Alpine Sports Watch Manufacturing - Since 1883 Alpina was brought to life in 1883, when Swiss watch making visionary and alpinist Gottlieb Hauser founded the Alpina Swiss Watchmakers Corporation, and in doing so united the leading Swiss independent watchmakers, who became known as the Alpinists. Initially, the Corporation was developed to optimise the manufacturing of movements and watches by forming a union of manufacturers and suppliers, but Alpina soon producing in-house calibers. 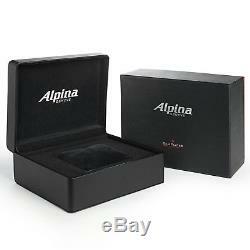 It is no exaggeration to say that Alpina was one of the first leading manufacturers of Swiss watches. More than any other watchmaker, Alpina was responsible for the sports watch as it is known today. Gottlieb Hauser was convinced that Alpina would become supremely successful worldwide for the quality, durability, precision and design of his watches. He wanted to provide sportsmen, engineers and adventurers with the ideal watch. In 1938 his vision became reality with the introduction of the Alpina 4. In that year, Hauser revolutionised the sports watch by imposing the four essential principles for any watch to be called a true Sport Watch. He insisted that a sports watch had to have each of the following four characteristics: 1. Through strict adherence to these principles, the legendary Alpina 4 watches became the timekeeper of choice for Alpinists, the Air Force, the Navy and the Military. Still independent today, the ideals upon which Alpina was founded are still alive in our Geneva manufacture, where we make professional sport watches to the most exacting horological standards, including the Alpina 4. We manufacture four fully in-house calibers, the AL-980 Tourbillon, the AL-718 World-Timer, the AL-950 Regulator and the AL-710 Automatic Small Date. Votre satisfaction demeure notre priorité principale, et de loin ; nos agents vous accompagnerons tout au long de votre acte dachat. Mettre à votre disposition toutes les informations que nous avons sur chacun des produits que nous vendons, par le biais de nos pages de produit. Vous vendre des produits de qualité, ayant fait lobjet dun contrôle de la qualité. Prendre en charge tous les aspects afférant a lexpédition, ainsi quà lacheminement de chaque commande et ce jusquà ce que la livraison ait eu lieu. Intervenir auprès des services compétents si retard il y a. Vous accompagner, en vous offrant un service après-vente impeccable, et à lécoute. Le succès de notre entreprise repose sur notre capacité à assurer votre satisfaction, cest pourquoi, nous comptons sur votre coopération, en nous tenons à votre disposition durant le processus tout entier! Nous acceptons les demandes de retour contre  article de rechange,  remboursement ou bien contre  crédit en magasin. Veuillez consulter la rubrique « Expédition et paiement » pour plus amples renseignements concernant notre politique de retour. Si vous souhaitez vous rétracter. Il est impératif que vos coordonnées soient à jour à la passation de la commande. Nous ne livrons pas les boites postales, bases militaires, hôpitaux, hôtels, etc. Reste du monde : veuillez prévoir approximativement 14 jours ouvrés pour lacheminement. Veuillez noter que nous pouvons décider, pour des raisons liées à la logistique, de procéder à lexpédition de votre article à partir dun entrepôt à linternational. 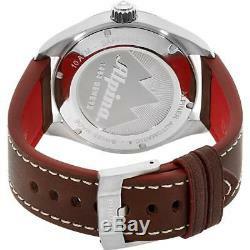 L'item "Alpina Alpiner Homme 44mm Bracelet Cuir Marron Automatique Montre AL-525SS5AQ6" est en vente depuis le mercredi 30 mai 2018.